Yesterday I was g-chatting with my pal Linds and she shared with an amazing find! I was so excited to pick him up for my office, but the bidding on it didn't end till today. I always wait to the very last minute to bid on things in order to hopefully get a good deal and have my bid be the last one before it ends so no one can out bid. It's a dangerous game and you win some and lose some. Well today the bidding on the phone went quite high ($45) pretty high considering the bidding started at $5.99. I was just heading in from the supermarket, got a phone call, got distracted and ran down to check the bidding. Sadly it was over. Not one to give up so easily I started searching on ebay and I found the very same phone for a buy it now price of $39. Sold! I can't wait to use it in my office. I think he will go great with my logo! That is excellent. What did you search to find that little critter? 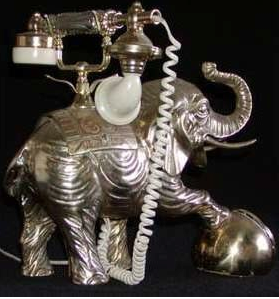 "elephant phone"? Love the new logo by the way. just saw you on design*sponge, congrats!!! What a great find. I love when I find the perfect think, and everything turns out perfect. OMG! He is so precious! It's perfect for you. You've got to love those little victories! Love the phone, it does indeed go wonderfully with your logo! so cute! and i love the new logo. everything you do is so great, can't wait to see the direction the website is heading, and to see more and more projects you complete! :) one talented, busy little lady, you are!! Yay! How great that it worked out. How perfect! Doesn't lindsay find it all? Can't wait to see it in your office! Love that phone and you logo! Have you read my elephant post on what it means to have the truck up? Yeah for elephant photos- its so cute and going to be perfect in your office!! this is a completely random question, but whatcursive font are you using in your new logo? I absolutely love it and would really appreciate knowing what font it is..thanks! Some of my greatest pieces came from online Goodwill! And I am the MOST proud to show them off. I was so tired last night that I forgot to go back on three items that I had been watching for a WEEK! I am so mad at myself today because if I set an alarm on my phone and remember to bid, I usually win the item. But do always check around on the Goodwill items because while I have gotten amazing deals, I have also almost fallen into a bidding wars over items that turn out to be quite common and much less expensive on Ebay. I am hopelessly addicted to online Goodwill. It's actually worse than my Criagslist addiction. BTW, adorable phone. And I mean ridiculously adorable!